German philanthropist and reformer; born in Halberstadt Oct. 17, 1768; died in Hanover Sept. 14, 1828. Originally his father's name was Jacob. His parents were in humble circumstances. Owing to the very low level of efficiency of the Halberstadt public schools, Israel attended mainly the Jewish religious school, in his leisure hours studying on his own account. At the age of nineteen, after having accumulated a small fortune, he became engaged to the granddaughter of Philip Samson, founder of the Samson-Schule at Wolfenbüttel, at which Zunz and Jost were educated. Jacobson took up his residence in Brunswick, and, possessing great financial ability, rapidly increased his fortune. He established (1801) in Seesen, near the Harz Mountains, a school in which forty Jewish and twenty Christian children were to be educated together, receiving free board and lodging. This close association of children of different creeds was a favorite idea of his. The Jacobson school soon obtained wide reputation, and hundreds of pupils from neighboring places were educated there. During the hundred years of its existence it has stood foremost in every line of educational work. Jacobson very soon perceived the necessity of imbuing the young as early as possible with proper religious impressions. In 1810 he built a beautiful temple within the school-grounds and showed his Reform sympathies by supplying it with an organ, the first instance of the placing of an organ in a Jewish house of worship. Hymns in German were sung by the boys; and prayers in German were added to those in Hebrew. The liberality of his views was further shown by his strong advocacy of the introduction of confirmation. 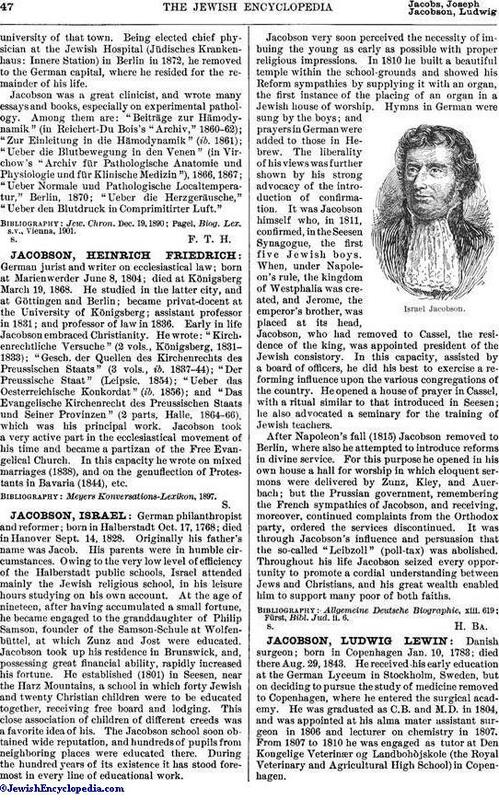 It was Jacobson himself who, in 1811, confirmed, in the Seesen Synagogue, the first five Jewish boys. When, under Napoleon's rule, the kingdom of Westphalia was created, and Jerome, the emperor's brother, was placed at its head, Jacobson, who had removed to Cassel, the residence of the king, was appointed president of the Jewish consistory. In this capacity, assisted by a board of officers, he did his best to exercise a reforming influence upon the various congregations of the country. He opened a house of prayer in Cassel, with a ritual similar to that introduced in Seesen; he also advocated a seminary for the training of Jewish teachers. After Napoleon's fall (1815) Jacobson removed to Berlin, where also he attempted to introduce reforms in divine service. For this purpose he opened in his own house a hall for worship in which eloquent sermons were delivered by Zunz, Kley, and Auerbach; but the Prussian government, remembering the French sympathies of Jacobson, and receiving, moreover, continued complaints from the Orthodox party, ordered the services discontinued. It was through Jacobson's influence and persuasion that the so-called "Leibzoll" (poll-tax) was abolished. Throughout his life Jacobson seized every opportunity to promote a cordial understanding between Jews and Christians, and his great wealth enabled him to support many poor of both faiths. Fürst, Bibl. Jud. ii. 6.